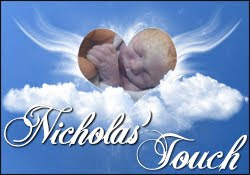 So, thanks to the help of a friend close by and Holly for helping with posting it.... Nicholas' Touch has a button! I really love it. I am still working on one for the Angel Wings Memorial Boutique - nothing has "jumped out" at me yet. Please grab my button for your blog if you like! The code is located in the sidebar. Will do. It is gorgeous! I am going to grab your button. It looks wonderful. Great job. I think it turned out so great! I'll grab it! That button is so beautiful. I came across your blog and just wanted to tell you my heart goes out for you and your loss. Beautiful button! Your son is just beautiful!